Always dreamed of owning your own island? When I saw on this video what one man did all on his own, creating his own island, I was inspired to share this in my blog about our major global pollution problems. Collecting plastic bottles and bundling them together in fishing nets to create a floating platform on water was not a new idea. When my son was a scout, a group of 10 boys would make floats with big plastic drums and tied them together. Not that it was always a success, but the fun they had made up for it. Is this proof of the man’s own island not unbelievable! Why not build a platform to house a whole village! Today with all the junk in the ocean from the pollution and the tsunami in japan, could a team of people not group together and create a floating landscape where herbs, veggies, plants, trees and even animals can reside? This kind of recycling could give a great many people who are out of work a purpose. Let’s clean up our ocean waste. Plastic is not natural, it is man made and plastic floats and chokes the environment. It disrupts the food chain. Look what a nine year old came up with! If many people across the globe will pull together a difference can be made. Why throw your garbage away when you could build a house out of it? After discovering what people all over the world already do with ‘plastic junk’ I finish this article with some images and links on demonstrations how people created products from what many of us throw away. Living Wall System What energetic people! 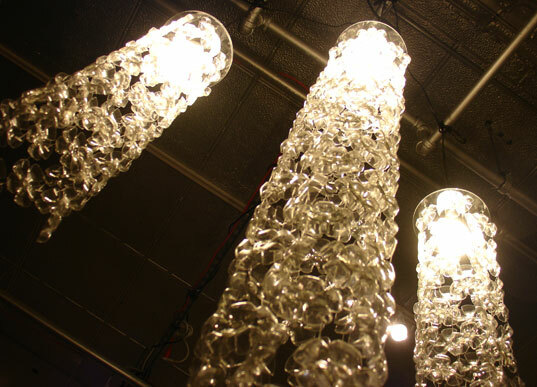 Making a sculpture with just bottles! “Hundreds of people — including government officials and traditional leaders — have been coming to see how the [house’s] walls are built in the round architectural shape popular in northern Nigeria. 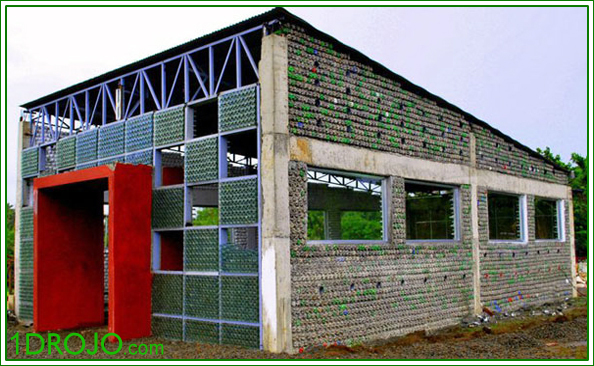 8000 2-liter plastic bottles can be recycled and used to make a classroom! Why can that not be a community project in South Africa! I will now look at a plastic bottle and think…What can I do with it? In Clovelly where we live we have 4 different collecting bins for: plastic – compost – paper and one bin for our other disposables. I now asked myself the following question: If ‘plastic’ products would become a very valuable item, how would we treat it then? Why not PAY people for the plastics in ways so they can sustain themselves? We pay R10.- each month for the plastic to be taken away, and we hope that this small fee gets paid to the people who sort out what is being collected. Plastics sit at the heart of our modern, technology driven society and make life for most of the developed world a lot easier but…. what of this ‘magical’ substance disappeared? Due to their relatively low cost, ease of manufacture, versatility, and imperviousness to water, plastics are used in an enormous and expanding range of products, from paper clips to spaceships. But then I was contemplating, we know there’s no such thing as “away,” because you can’t destroy matter! What is happening now during our END OF TIMES? We’ve been throwing things away not worrying about where “away” is, and “away” is coming back to haunt us. ← Launch Giveaway – Win 7 VF Novels! I’m so glad. The man with his own island really made my day.